McDonald’s at East Coast Park will cease operations on March 18th 2012. To thank customers for their support for the past 30 years, McDonald’s is giving a FREE Blueberry Melts with every Extra Value Meal, only at McDonald’s East Coast Park, after breakfast hours, while stocks last, From 12 to 18 March (Monday to Sunday). McDonalds East Coast Park holds fond memories for many of us where school excursions, birthday celebrations, first dates and meaningful occasions were spent with friends and family. 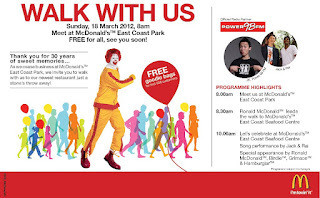 The nearest McDonalds is located at East Coast Seafood Centre, Block 1202 #01-01 Seafood Centre East Coast Parkway S(449881) and was opened last November .